Monkey Monkey Music will make your child’s 1st Birthday Party something extraordinarily special. We have a ton of experience performing at 1st Birthday parties and they are some of our favorite types of birthday parties to perform at. We know the type of planning and detail that goes into planning a 1st Birthday Party which is why hiring a more sophisticated type of children’s performer such as Monkey Monkey Music will match the level of elegance, fun, and warmth that defines the Korean 1st Birthday Party. Music entertainment for a 1st Birthday Party is an excellent choice. You have already put so much thought and detail into the beautiful balloon decorations, exquisite cakes, delectable foods, and the fortune telling ritual. 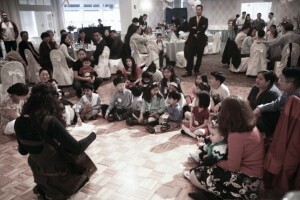 Monkey Monkey Music excels at providing the top Music Entertainment for a Korean 1st Birthday Party. We know how to make this unique birthday party one of a kind, memorable, and special. All of the guests, not just the children will dance and rejoice in this very special occasion. Monkey Monkey Music has a wealth of experience with these beautiful parties and will create something that you will remember for a lifetime.